We have covered the brief bio-data, inspirational journey and background of Harikrishna Pai (CSE 2013 Rank 218) in the Part 1 of interview. Now the bigger questions: the study plan for Prelims and Mains and the daily time table followed. Hari also explains about the websites followed and magazines he referred in this part. We hope this interaction provides aspirants valuable insights about UPSC Prelims, Mains and Interview. ClearIAS.com: How did you approach this exam? What was your strategy in general (Prelims, Mains and Interview)? UPSC doesn’t expect rote learning; instead, the exam demands a clear understanding of concepts and their application to different issues. So I started with basic books that make me understand different concepts in a simple manner (Eg- NCERT). Similarly keeping in touch with current developments is very important, where reading newspaper and magazines help a lot. Barring the syllabus, I believe that there is little difference between Prelims and Mains preparation. However, both demand different skill-set. I practised model question papers for both the exams. Facing interview is more a question of confidence and for this the support from friends who attended interview with me helped. Moreover model interviews by eminent persons were facilitated by the institutes, which are also greatly helpful. ClearIAS.com: How long (Years/Months) have you been preparing, before you gave this attempt? Also, on an average how many hours did you put on a daily basis? How did you manage time? I started dedicated preparation towards the end of my post-graduation, nearly one year before the actual examination. I spared 10-12 hours on an average. But I feel that it is not the number of hours that count, rather the productive work done in those hours. So, instead of a rigid timetable, I used a general plan approach over a timepeiod. Whenever I felt that I lose focus, I use to relax, only to come back fresh and carry on. ClearIAS.com: Were you a person who studied alone? Or a person who favored the combined-study approach? I mostly did self-study, especially in my optional, as I was the lone person opting History among my friends. For GS, we used to discuss issues and support each other in different topics though the study part was done by self. ClearIAS.com: What were the Newspapers and Magazines you followed? How many hours did you devote for newspapers? Any tips on newspaper-reading? I use to regularly follow the Hindu along with one vernacular newspaper. I didn’t fix a strict time for this too, however it took nearly two hours for reading and preparing notes. Magazines- used to refer Frontline, Kurukshetra and Yojana. But here I used selective reading by choosing relevant issues. Regarding newspaper reading- Focus on issues, rather than news per-se…Eg : recent Israel Palastine conflict- more important issues are like What are the points of conflict, recent developments over the issue, Stand of various international organizations, India’s approach, effects of this issue on regional/international events etc rather than individual incidents involved. So we need to focus on these questions. Thus importance of a news item is to be judged with regard to whether it touch/relate to various topics we cover in the exam. Such items need greater focus. Naturally National-international issues need greater attention rather than local issues. So such (local/ relatively less important) items can be casually scanned. Editorial articles are to be screened based on relevance. This approach will help us analyze things happening around us, which apparently forms major part of our mains GS preparation. ClearIAS.com: Did you attend any coaching institute? If yes, can you provide the details for each stage (Prelims/Mains/Interview)? How helpful were the coaching institutes? Prelims and mains preparation for GS was done at Civil Service Institute, Pala. As I already told, here I got sound idea about various subjects from here. 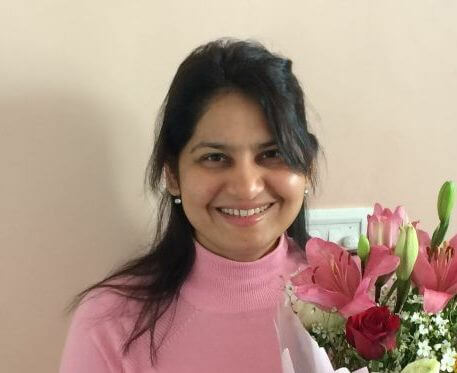 The familiarity you get with the examination is the most important part that coaching institutes can do and in this regard, this institute had experienced and dedicated teachers who helped me a lot. For my optional, I got some basic idea from the initial stage of coaching. Remaining part was self-study. I collected names of books from my senior friends. I also joined for a test series at Delhi (Baliyan Sir) to fine tune my answer writing. This also helped in time management, building confidence etc. For interview I attended mock interview sessions at Civil Service Institute, Pala and Kerala State Civil Service Academy, Thiruvananthapuram. 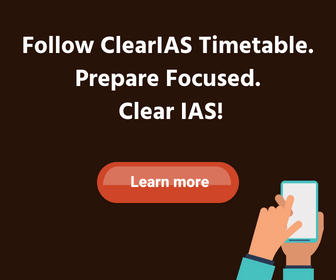 ClearIAS.com: What websites will you recommend for future aspirants for UPSC preparation, including the government websites? Websites of various ministries help to get details about schemes, programmes etc. ClearIAS.com: Did you use Social Media like Face book, Twitter or other forums for UPSC Preparation? Or did you say good-bye to the social media during preparation days? Any tips? I did not rely much on social media for my preparation. I used twitter for following some important sites during mains preparation. I’m not so regular on fb, but used them to chat with my friends. So, even though I didn’t say good-bye, my use was limited. I used a mix of both, depending on the context. ClearIAS.com : How did you keep yourself motivated for this one year long exam? Perhaps this may be the most challenging part in preparing for the exam. I think we must remember that we are on a long journey, where success never comes in a day. This is true for any field in our life that perseverance is essential to be successful in the long run. For any person who keeps his/her aims high, challenges are bound to come…face it with a smile, when it passes, you will realize that you had a then unknown potential to face it. Nobody’s life was all success..take any winner’s life (in any field), it was not a cakewalk. The main point is to rebound from our falls..we turn better each time..
Never be a pressure cooker..open up yourselves to your closer ones..
And some Exam specific ones.. This exam is not one in which you can study the whole syllabus or expect questions from areas which you have learnt.. So if you are clear with your part, there is no need for undue tension regarding what others might have learnt, what institutes might have taught etc. Change the topic if it doesn’t fit to your mood. Come back later. 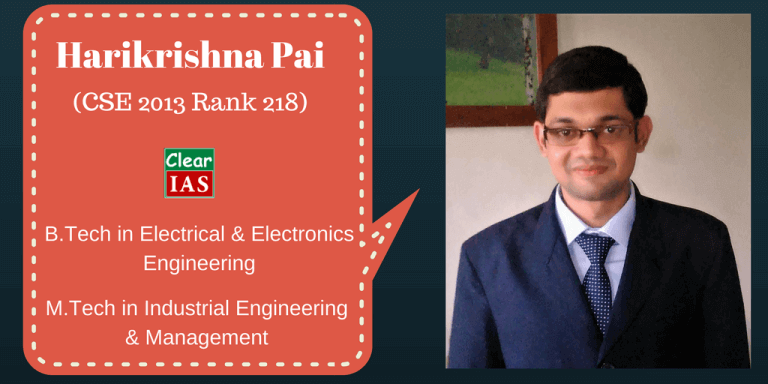 Click to read Harikrishna Pai (CSE 2013 Rank 218) UPSC Topper’s Interview – Part 3.